Reto Berra made 38 saves and stopped both shootout attempts in his debut with the San Diego Gulls while Kevin Roy had three assists and a shootout goal in a 4-3 victory over the Ontario Reign Saturday evening in Ontario. Berra stopped all four shots he faced in the five-minute overtime and all 19 in the first period hours after being reassigned to the team by its NHL parent team, the Anaheim Ducks, who no longer needed a third goaltender after Ryan Miller was deemed to be fully recovered from a wrist injury that had sidelined him until last Sunday. Roy assisted on all the Gulls goals in regulation and scored on the first shot of the shootout. Jonny Brodzinski took Ontario’s first shot of the shootout and was stopped by Berra. Spencer Abbott scored on the Gulls second shootout shot. Berra stopped Philippe Maillet’s shot to give the Gulls the victory, a night after a 1-0 loss to the Reign at the Valley View Casino Center. The Gulls (5-4-1-0) tied the score with nine minutes, eight seconds left in regulation on Deven Sideroff’s power-play goal before a crowd announced at 8,238 at Citizens Business Bank Arena. The Reign (3-6-0-1) had taken a 3-1 lead on unanswered goals by Brett Sutter and Paul LaDue in the second period and Michael Mersch in the third period. Sutter is a son of former Los Angeles Kings coach Darryl Sutter. The Kings are Ontario’s NHL parent team. The Gulls took a 2-0 lead in the first period on Jeff Schultz’s first regular-season goal since March 25, 2016 when he played for the Reign and a power-play goal by fellow defenseman Andy Welinski. LaDue’s goal was the only one scored by Ontario on eight power-play opportunities. The Gulls scored on two of six power-play opportunities. They were unable to capitalize on a 2:37 disadvantage at the start of overtime from Mersch’s double-minor for high-sticking with 1:37 left in regulation that carried over to the overtime. Overtime in the American Hockey League is usually played with three skaters for each team, two less than usual. 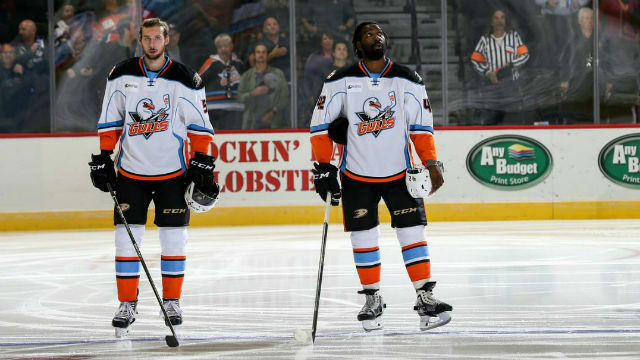 The Gulls were allowed a fourth skater to start the overtime under the AHL rule forcing the penalized team to face an additional skater, instead of playing with one less skater, in overtime. Jack Campbell made 23 saves for the Reign. Gulls left wing Mike Liambas and Ontario left wing Sam Herr drew five- minute major penalties for their fight 14:45 into the first period. Liambas received a major and game misconduct for engaging in his second fight of the game. Liambas also committed a boarding penalty before fighting with Reign left wing Jamie Devane at 9:59 of the second period. Gulls defenseman Brian Cooper was sidelined for the rest of the game after being hit by Herr in the first period. The Gulls will begin a season-long five-game homestand Wednesday against the Texas Stars, the Dallas Stars AHL affiliate.